Knowing main types of wine is the first good step to start knowing the world of wine. Although many people may think that identifying wines into such the red or white wine can be as simple as using your eye to classify the color, each wine type actually has its own character and identity which according to grape varieties andwine region and also including tannin level, aroma and bouquet, sweet, and alcohol level which all affect the flavors in some way. To make it simple, we will classify the wine into 5 main categories; Red, White, Rose, Sweet or Dessert and Sparkling. Many of you may understand that white wine is made of white grapes alone, but actually it can be either red or black grapes. The exact way to make white wine is to extract the red pigments away and utilize on grape juice only. Mostly, white wine will provide flavor character including bright, savory, and creamy based on the inputs. Recommended varieties for wine beginners are Chardonnay, Riesling, Sauvignon Blanc and Moscato. Recommended Wine Glass: We recommend a tall suitable size wine glass e.g. 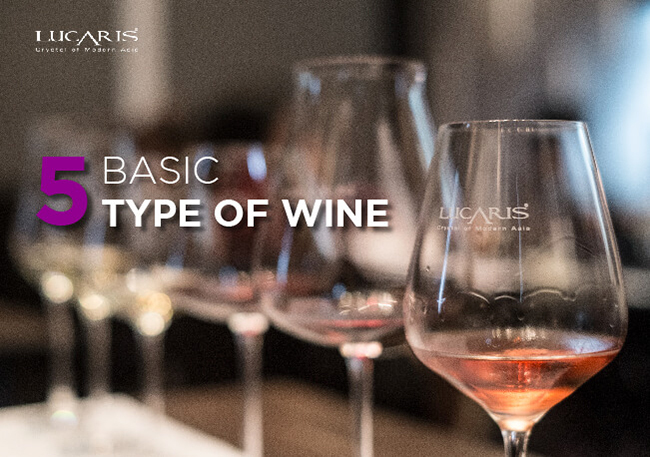 LUCARIS Desire Crisp White for the wine with distinctive flavors of tart and bright. 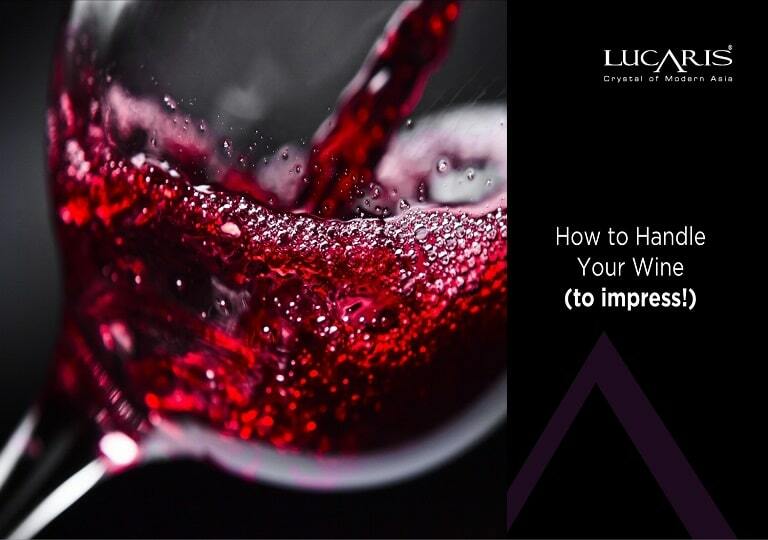 For the outstanding aroma and full-bodied white wine, try to pair with a shorter glass such as LUCARIS Desire Rich White or any LUCARIS Chardonnay Wine glass with the signature innovative of Aerlumer@ to help spread the fragrance and flavor of full-bodied white wine. Production of red wine is quite similar to making white wine but only with the addition of grape skin, grape pip and seed incorporated into the fermentation process. Red wine will be fermented in higher temperature, to extract color, tannin, aroma and flavors with different level of concentration varies by duration of fermentation. 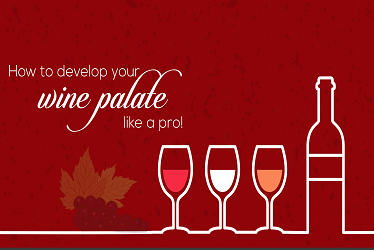 Cabernet Sauvignon, Merlot, Pinot Noir, and Zinfandel can also be a good choice to start with for wine beginners. Food Pairing: If it is a light-bodied red wine, go with grilled vegetables, white meat or chicken. A medium-bodied to full-bodied can get along well with meat dishes such as steaks, hamburgers or smoked meat but when you feel like pairing wine with Asian dishes, you can read it from here. Recommended Wine Glass: Aged red wine should be served in a big bowl glass to let the wine breathe (oxidation process) better such as LUCARIS Desire Elegant Red or any LUCARIS Burgundy Glass. 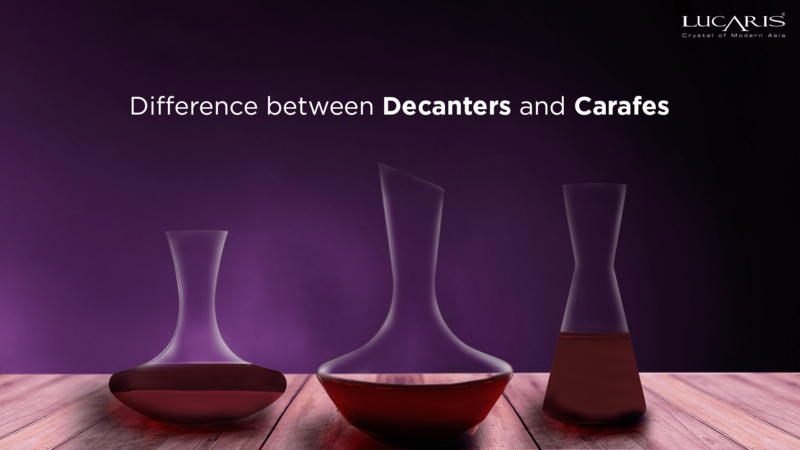 For young red wine, try LUCARIS Desire Robust Red with the Aerlumer@ innovation or any LUCARIS Bordeaux and Cabernet glass. Rose wine with a pink rose color is made from red or black grape with a short fermentation time, about 12-36 hours only. However, there is another popular style to make this Rose, by just straight away blending red wine and white wine together. The flavor of this wine ranges from dry to sweet and comes with a pale to dark pink color and a lower level of tannin. Food Pairing: Rose wine always goes well with a light flavor dishes like fish, poultry, or fruit. 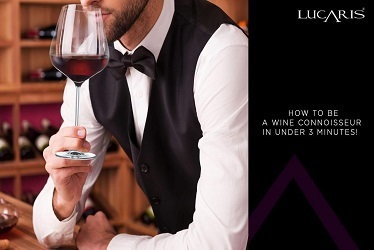 Recommended Wine Glass: LUCARIS Desire Universal is an ideal for serving Rose wine with the magic of Aerlumer@, the bottom curl lines. This glass also goes well with both red and white wines since it was designed to cope with characters and identities of each wine type, the perfect tool of the trade for restaurateurs. There is no constant definition for Dessert or Sweet wine. Mostly, it is because of the character of sweetness itself with the occasion of serving with desserts after the meal. But in some countries such as United Kingdom, people usually drink sweet white wine as an aperitif, before the meal, and sweet red wine to rinse their palate after. Sweet wine can be categorized into Port, Tawny, or Sherry and so on. Food Pairing: In addition to the dessert, the wine can also be paired perfectly with smoked meat and soft cheese too. When thinking of Sparkling wine, we will be reminded of a celebration. The sparkling bubbles from carbon dioxide (CO2) occur naturally or specifically are added during the fermentation process. Sparkling wine can be categorized further by region, for example; Cava in Spain, Asti or Prosecco from Italy and Champagne from the Champagne region in France. Food Pairing: If you are holding a party, try pairing the sparkling wine with salad, cheese, fish, or bread. 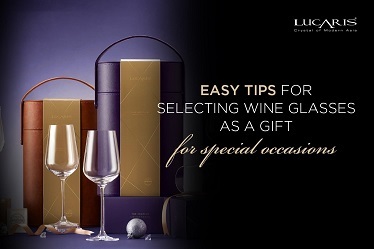 Recommended Wine Glass: An elegant tall glass helps retain temperature and bubbles such as LUCARIS Desire Sparkling or any LUCARIS Champagne Glass. The content in this article helps you choose the wine you prefer matching the right glass and food. If you want to learn more in details about wine culture, we encourage you to read these stories. 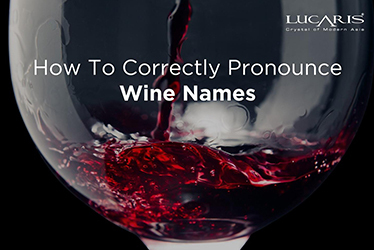 Start with “Popular varieties of grapes used to make wine”, and “Wine Region”. For those who are looking for “Wine Glass” to serve your favorite bottle, you can browse through these leading online sites; Wine-Now, Central and Lazada and search for LUCARIS crystal wine glasses.